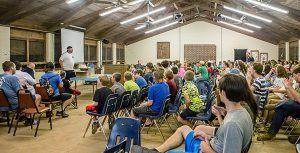 I know we go to camp to teach young people about our Lord. As adults, we are supposed to guide them. I get that. But for 15 years I have discovered that teaching and learning is a two-way street. This year was no different. Let me tell you how our campers schooled me at Indian Creek Youth Camp. Every child is unique. The differences are great. Apart from the obvious age differences and gender differences, there are deep and not so obvious distinctions among our campers. Some are well trained in the Scriptures; some are not. Some come from solid Christian homes; some do not. Some think girls have cooties and others think boys are yucky. Some like aggressive sports; others prefer video games. Some like to swim; others like to nap. Treating one child like another is a massive mistake. When Phillip taught the Ethiopian, he began where he was (Acts 8:35) and preached unto him, Jesus. We should approach each child individually and address their unique needs as we guide them toward the Lord. Have we convinced ourselves that children would rather play, goof-off, or sleep in instead of worshipping? Maybe it is us that prefers to skip church. Maybe extracurriculars are more important for us than them? Jesus taught us to put him first. Read Mathew 6:33 and Luke 9:57-62. I dare you. Read it and then tell me why you don’t have your children before the Lord constantly! Any parent who does not bring up his child in the “nurture and admonition of the Lord” (Ephesians 6:4) is a failure! The world is not what it was when we grew up. Our Youth are dealing with deep issues that will affect the rest of their lives. This week, 17 young people publically asked for prayers in our large group assemblies. Others asked for private prayers in their cabin groups and in one-on-one meetings. I was knocked back on my heals at the raw emotions that poured out from them. They spoke of deep and profound doubt, they spoke of dark thoughts of self-harm, they spoke of recurring sin, and they spoke of parents who don’t care. Tender Jesus heard it all and was tempted by all (Hebrews 4:15). He watched the hatred of the religious leaders focused upon the woman taken in adultery (John 8:1-11), and he saved her life and likely her soul. Of children, Jesus said, “see that you do not despise one of these little ones…” (Matthew 18:6). He said, “Whoever causes one of these little ones who believe in me to sin, it would be better for him if a great millstone were hung around his neck and he were thrown into the sea.” (Mark 9:42). Our children are waging a battle that we never dreamed of. They face real skirmishes every day. They cannot opt out of this great spiritual war we face. We must not fail them. We are not doing enough to steel them against the wiles of Satan! Let us do better! 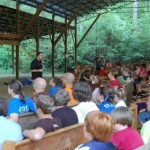 Previous post: Christian Camp – Why?